Our yurts are well insulated but they still require a heat source to keep you warm in a cooler climate. Mongolians were using an open fire in their gers until 200 years ago, but they now use simple iron stoves and run the stove pipe through the toono (dome). We sell these stoves at GroovyYurts as simply “decorative” stoves, as they do not comply with North American standards. We are currently reviewing different stove options, including the Aneway stove from the UK, as options to recommend. To date, our customers have had great success with the Four Dog stoves http://fourdog.com. Larger diameter yurts (7-wall and up) may require a larger stove if you want to avoid feeding your stove through out the night. We recommend slow burning wood stoves, but pellet stoves will work as well. Electrical or propane heat will also work in our yurts, but may lack the intensity to dry it from the inside out, in the event of very humid weather conditions. A solid alternative, if you are living on grid, is a simple wood stove backed up by an electric (or propane) heater for support throughout the nights. http://woodheat.org will provide some interesting information on wood burning stoves. Adding windows to your yurt will reduce the capacity to keep heat in, but adding a layer of felt will help to offset this. Having the stove pipe run through the toono (dome) is recommended. The draft will be stronger, and the heat more regulated. Another good tip is that there will be far less heat loss with the longer portion of the stove pipe situated inside the yurt. To comply with most North American codes, you will need an insulated stove pipe. You must have at least a 2” minimum clearance from the closest wood part, when installing a stove pipe. 6” stove pipes are usually a standard, but in some cases you will need to reduce to 5’’ as in the case of the 4-wall toono. 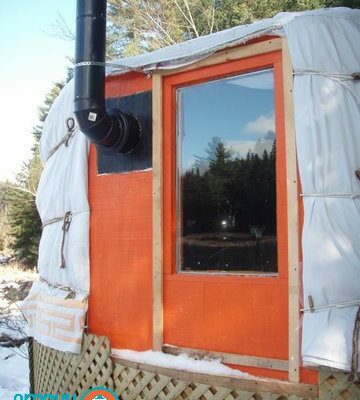 A 3-wall yurt will require a smaller stove pipe with a simple camping stove. The larger the yurt, the more volume you will have to heat, so a larger stove will be required. Mongolians use mostly 4 and 5-wall yurts for year round living in their extremely cold climate. Rule of thumb for choosing a stove : Aim for one that can heat 3x the surface of your yurt. For example, a 5-wall yurt is roughly 300sqft (env 27m2), so choose a stove that is advertised to heat around 900 sqft (env 80m2). For starters, Mongolians could not imagine having a toilet in their ger. Our customers as well, often choose a separate space for their washroom facilities. A shed structure or second yurt work fabulously. It is also easy to connect a smaller yurt to the main one for this purpose. 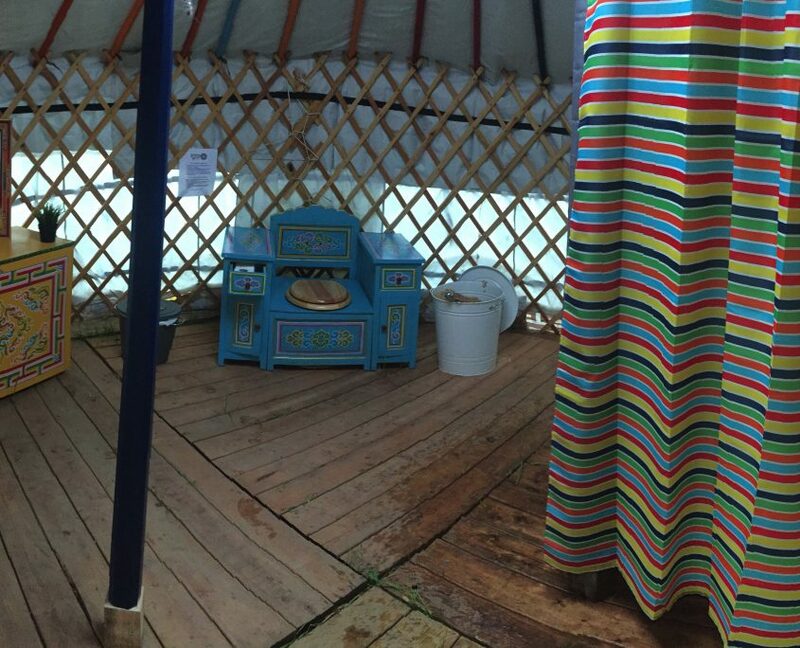 Some may choose to add half or full washrooms inside their yurts, either in plain view or separated by a curtain. One way or the other, it is easy to run plumbing from under the side of the yurt, or preferably through the platform or floor. Having a shower where large amounts of humidity are produced is not recommended in a Mongolian ger unless properly ventilated.